Pets have a disposition to be curious about everything around them. However, at times, this urge often leads them to unforeseen troubles. In fact, we have often found cases where pets choke themselves up or land themselves into life-threatening situations by ingesting some toxic substances, objects, etc. 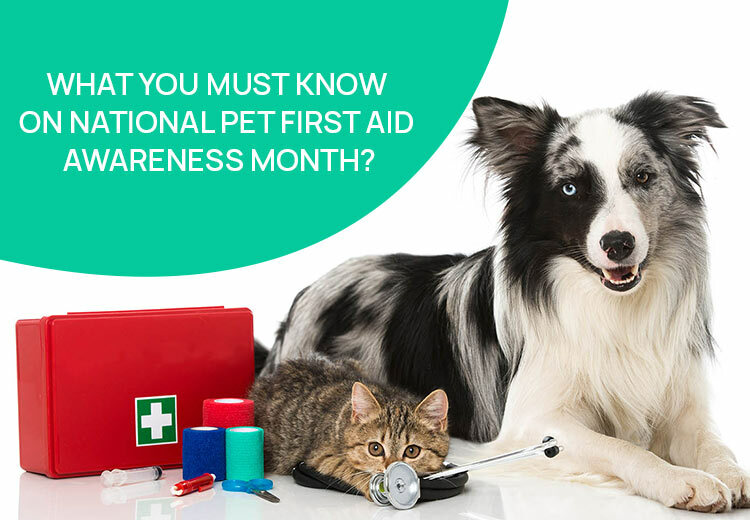 So, on this National Pet First Aid Awareness Month it is important that all pet parents must be apprised of the current stats regarding such accidents and what they can do to safeguard their pet in advance. Well, surprisingly, 90 percent of these accidents of poisoning are reported in the house itself, out of which 75% occur due to eating or drinking unwanted things. Talking about outdoor accidents, many pets are also run over by cars or may get involved in fights with other animals and get wounds that could fester if not treated in time which means pets are constantly under the radar. What To Do If Your Pet Has An Emergency? An injured pet that has met with an accident can get quite aggressive and may even bite, therefore you must first protect yourself from him. Put a muzzle or tie a rope around his mouth to stop him from biting and growling. Calm him down by calling his name and kneel down to his level to caress him. Once he becomes calm or passive and you have gained enough confidence, try to put him on a stretcher which could be carried to the emergency care facilities. Gently lift the stretcher and make sure his neck and back is properly supported in case he has back injuries or fractures. For cats. You can wrap her in a blanket or a big towel to prevent her from biting and place her in a case so you can take her to the veterinarian. Make a call to the hospital or ask your friend or family member to call the hospital for emergency services. In case the pet is suffering from external bleeding, try lifting and applying pressure to the wound area. In case of choking, try placing your fingers in his mouth to remove the blockage. However, do not perform this task if you are not confident about it. You can also try giving a Heimlich maneuver to remove the object which has caused breathing obstruction. How To Perform CPR On Your Pet? Before performing CPR it is important to check whether the pet is breathing or not. Most of the times, the pet would lie unconscious. In this case you should carry out artificial respiration tactic by extending his head and neck. Hold his jaws and blow air into his nostrils every 2-3 seconds. If the pet isn’t breathing, give quick multiple deep chest compressions until the pet resumes breathing on his own and regains consciousness. In case of ingestion of poisonous substance, it is important that you call the Animal Poison Control Center immediately. Report the case and meanwhile the emergency van arrives, try inducing vomiting by give a dose of hydrogen peroxide orally. This must be approx 0.5-1 ml per pound of his weight. However, if you are sceptical about it do consult your vet before administering anything. Pet First Aid Awareness Month is all about taking care of your gullible furry bundle that cannot save his life on his own and needs human assistance to take care of him/her. Therefore, we must stay vigilant of them and remain alert when we take our pet outdoors. Also, we must ensure that all the harmful household items that can cause hazard must be stashed away from their reach. Other than that, you must also ensure that he is in the pink of health all the time. Do all the necessary stuff to take good care of him, then be it giving quality food, grooming or putting him on preventatives. You know your pet is the only one who will always stay by your side even in the hardest of life situations, so you must reward him back with good care and intense love.